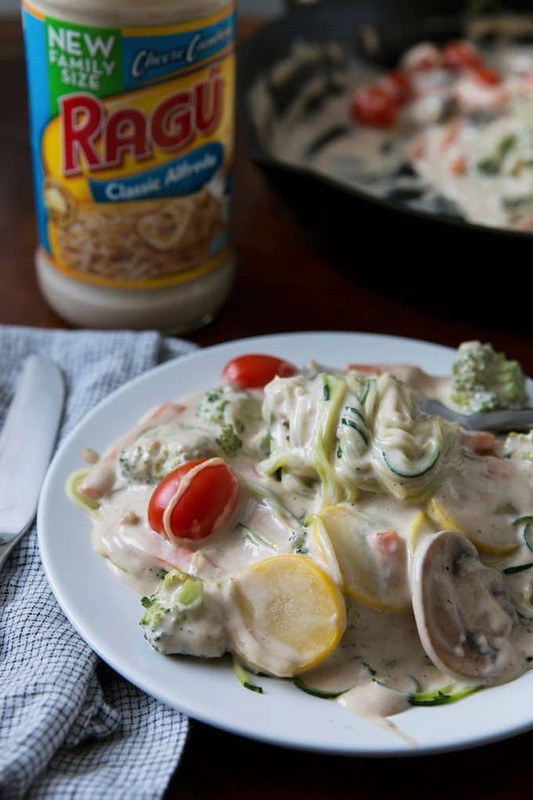 Zoodles primavera is a creamy and delicious recipe, perfect for weeknight dinners! 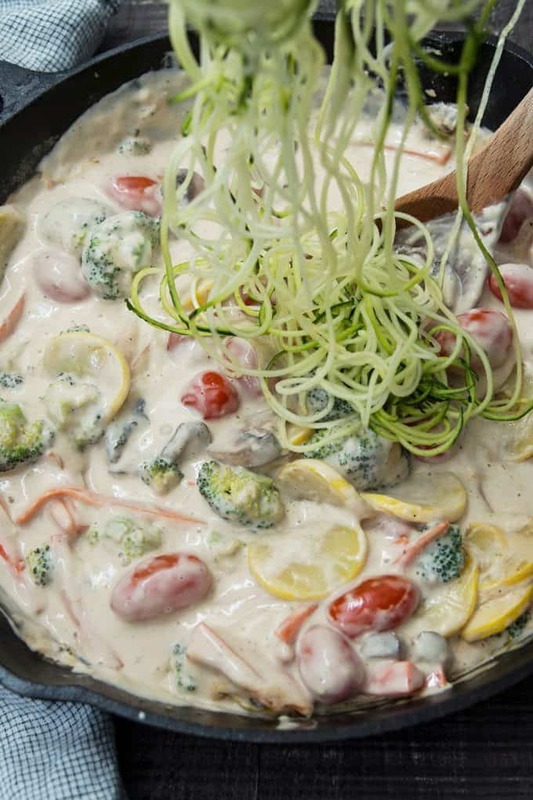 It’s extra colorful thanks to the zucchini noodles and vegetables – broccoli, cauliflower, carrots, mushrooms, cherry tomatoes, and yellow squash. I don’t usually order pasta primavera at restaurants and I don’t have a good reason. Maybe it’s the “no meat” aspect. Maybe it’s because there are so many vegetables and when I go out, I want to treat myself. But lots of vegetables doesn’t mean a dish is less delicious; it just has more vegetables. So why not go a step further and cut out the pasta? 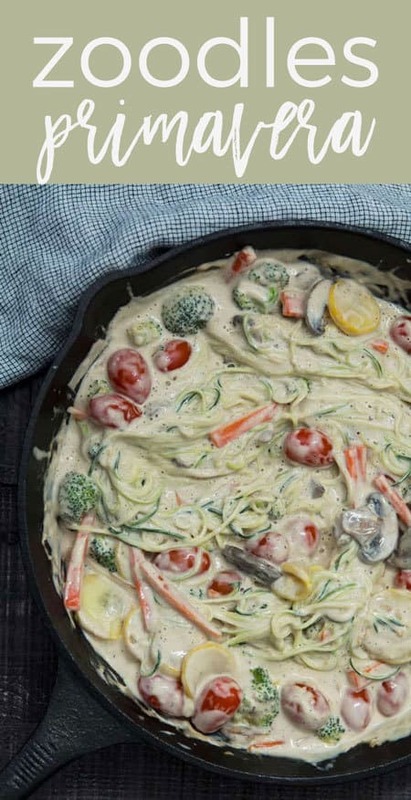 Zoodles to the rescue! I bought a spiralizer a while ago and it’s been sitting in my pantry, waiting for me to open it. Once I finally took it out and got to spiralizng, I wondered what I had been waiting for. Making zoodles is so much fun! I will always be a pasta lover but I can definitely make space for more zoodles in my life. 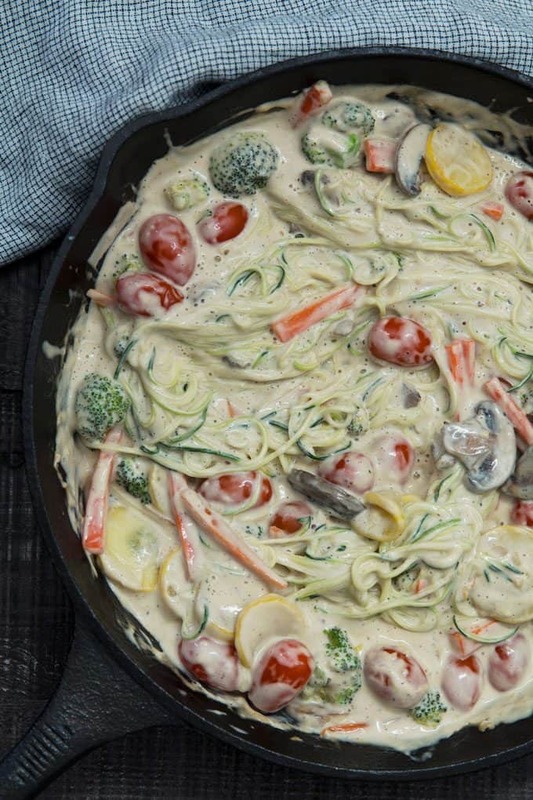 My zoodles primavera recipe includes lots of vegetables and RAGÚ® Family Size Classic Alfredo Sauce. 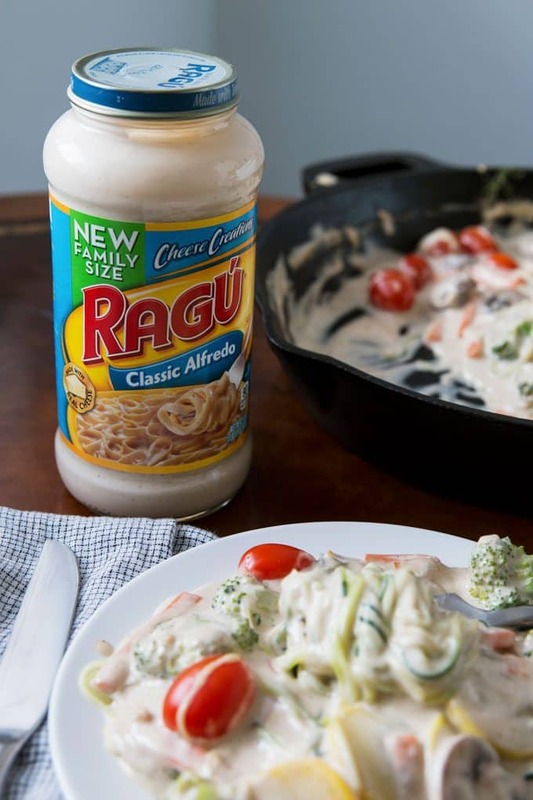 RAGÚ Family Size Classic Alfredo Sauce is a thick, creamy Alfredo sauce that’s packed with Parmesan and Romano cheeses. It’s bursting with cheese flavor. Add that cheesy flavor to the vegetables and you have a delicious dinner! It is made with real cheese and fresh cream and will save you so much time – spend your time zoodling instead of making sauce. Also, RAGÚ Family Size Classic Alfredo Sauce is perfect size for large family meals or leftovers the next day. 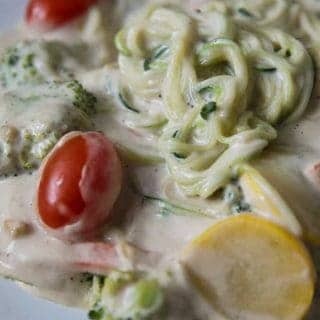 I used a variety of my favorite vegetables for my zoodles primavera recipe but you could add any of your favorite veggies if you want. Mushrooms, cherry tomatoes, carrots, broccoli, and yellow squash add flavor and so much color to this dish. Some cooking tips for you. Once a zucchini has been spiralized, it starts to become watery. Very watery – droplets of water will form quickly. I usually place all of my noodles between some paper towels and press on them to absorb some of the water. 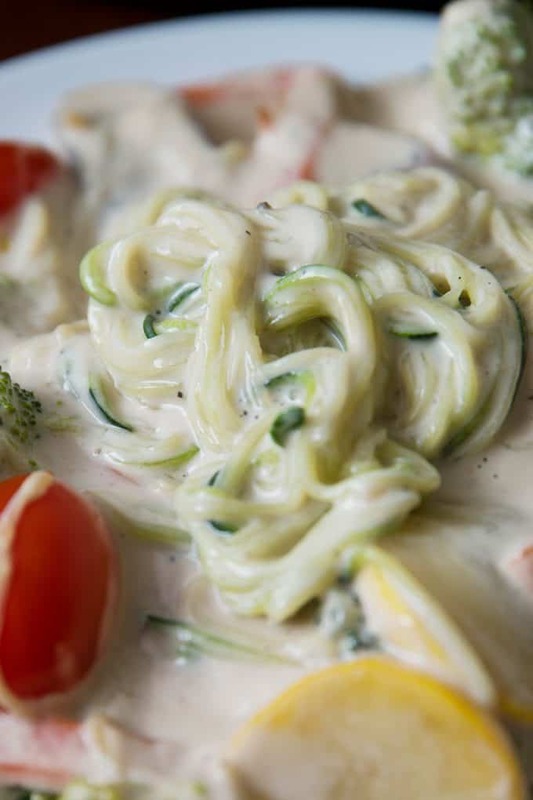 Zucchini noodles cook quickly – in under 2 minutes. I add the zoodles to the primavera when I’m done cooking the vegetables and have turned off the heat. The sauce is still very hot so the zoodles will cook even when the stove is off. If you have any issues with your kids eating vegetables, have them help you make the noodles. My mom always said not to play with my food but I don’t see any harm in this cooking game! 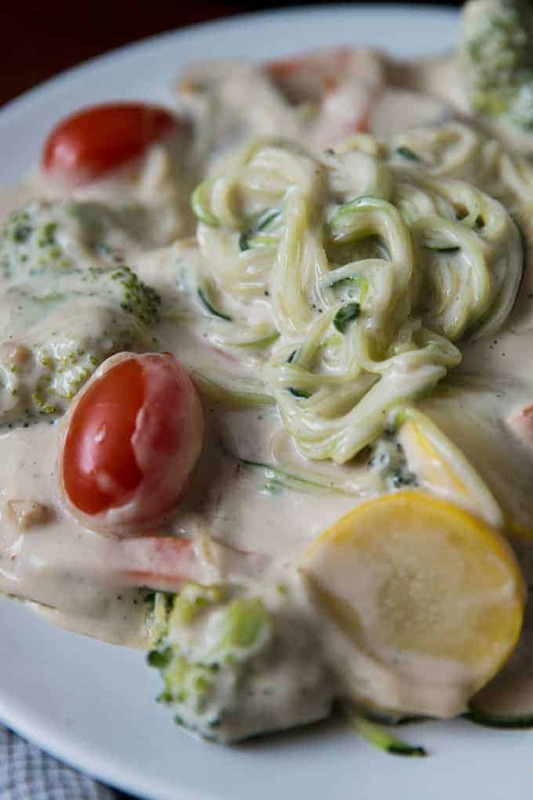 Zoodles primavera is a creamy and delicious recipe, perfect for weeknight dinners! It's extra colorful thanks to the zucchini noodles and vegetables - broccoli, cauliflower, carrots, mushrooms, cherry tomatoes, and yellow squash. Heat the olive oil in a skillet over medium-high heat. When hot, add the garlic and cook for 2 minutes. Then add the carrots, broccoli, and cauliflower. Cook for 5 minutes, stirring frequently. Add the mushrooms, cherry tomatoes, and yellow squash. Stir to combine and cook for an additional 5 minutes. 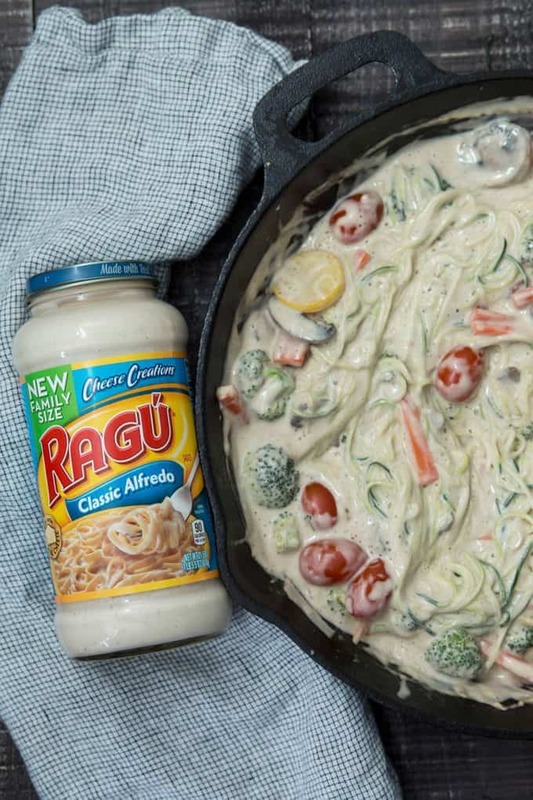 Add the entire jar of RAGÚ® Family Size Classic Alfredo Sauce, salt, and pepper. Combine with a spoon and bring to a boil. Reduce heat to medium and cook for 10 minutes or until the vegetables have softened. Turn off the heat, add the zucchini noodles to the pan, and toss. Wait 2 minutes to serve. Oh yes ; I’ve seen this on Pinterest; pinning in spite 🙂 ! I’d be all over this right now if I had a plate of it in front of me! It looks so creamy and delicious! I love zoodles. I have always used tomato sauce with them. I can’t wait to try this version!! I can see my kids devouring this right up! This is a “Mom Win” dinner right here!! 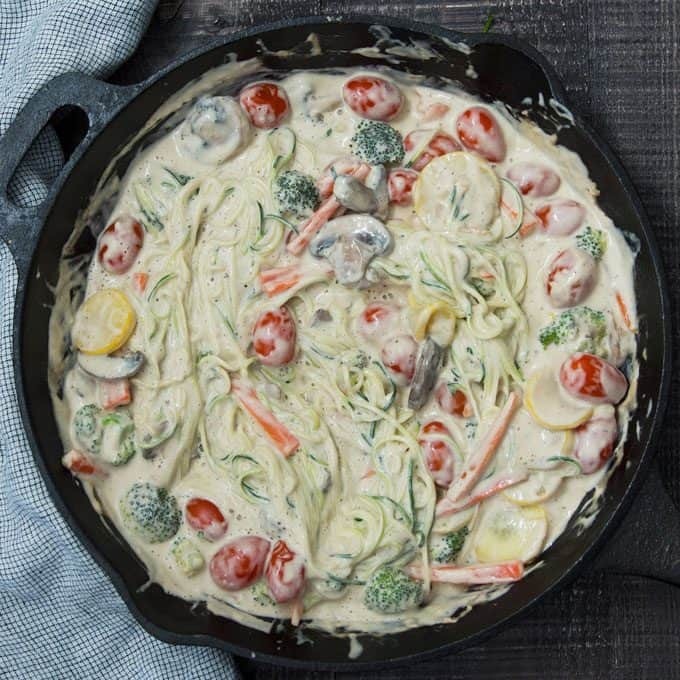 So many beautiful veggies in that creamy sauce….I think I might be in heaven! It looks so creamy! Would love to try it for dinner tonight! A very different recipe! I love it!